A wide spectrum of thoughtful Bible students could benefit from The CEB Study Bible. This text provides the reader with ample study notes, cross-references, maps, introductory essays to each biblical book, and a concordance. For those not familiar with the Common English Bible translation, the CEB was produced in 2011 utilizing the effort of over 120 translators from twenty-two faith traditions. One of the primary goals of this translation was achieving a balance between accurate renditions of the ancient original texts and clear expression to the target audience. The result is a readable version utilizing contemporary English. The translators also sought to “use gender-inclusive or neutral syntax for translating pronouns that refer to humans, unless context requires otherwise” (xxi). This translation was crafted in the church community for the church community. When one surveys the team of contributors to this study Bible, it is apparent these scholars are from diverse faith communities representing a wide range of Christian theological tendencies. With this understanding, no one branch of Christianity or denominational belief dominates the text. Of the sixty-three contributing authors, nineteen are female (30%). Since the purpose of the CEB is to provide an everyday English translation, it is no surprise to see that the overwhelming majority of scholars who worked on The CEB Study Bible are from the United States. 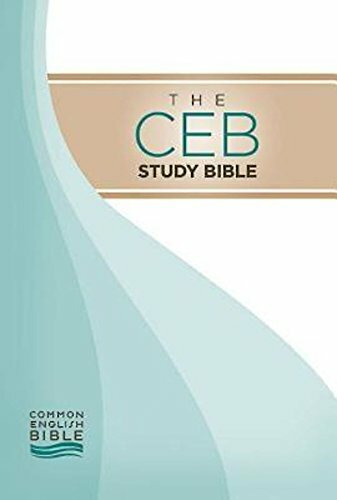 Individuals familiar with study Bibles will be pleased to see some of the additional features The CEB Study Bible offers. Each book of the Bible begins with an introductory two-page essay together with a related full color picture followed by a basic outline of the book. The format includes a single column page layout for the biblical text coupled with scriptural cross-references along the outer margins. The bottom half of each page has a two column layout with copious study notes highlighting individual verses and sections. These notes read like a condensed form of leading biblical commentaries (Interpretation, Expositor’s, etc.) that provide historical background and context rather than trying to persuade the reader to take certain theological positions. Each book also includes numerous brief topical essays which provide rich insights into the relevant history and themes addressed. One positive feature of The CEB Study Bible is its use of color: the text is black, the headings are maroon, the chapter numbers are goldenrod, the numerical cross-references are blue, and the essays have a light green background. These colors blend well to present a clean and aesthetically pleasing format while helping the reader quickly identify sections without being overwhelmed. The final section contains additional articles, a concordance, and twenty-one full-color maps. The concordance, while not exhaustive, contains eighty-two pages of entries, much more than would be expected of a study Bible. The high quality maps were created by the National Geographic Society. The supplemental articles in the back of the Bible approach various contemporary theological concerns and would benefit from a brief introduction. The articles discuss the authority of scripture, the Bible’s unity, how we got the Bible, the Bible and its chronology, and guidelines for reading the Bible. Each of the articles (five to six pages in length) guides the reader through common questions such as: Why is the OT relevant? Did the NT authors think they were writing scriptures? What is the proper use of the Bible? How should we approach scripture? The articles also touch on how the Bible has been used as a repressive tool in slavery, racism, and the abuse of women. Overall, they do an excellent job providing a quick overview of each topic and are helpful in theologically framing and understanding scripture as a whole. Christians who hold an egalitarian viewpoint will be encouraged when studying some of the materials related to gender equality in The CEB Study Bible. Immediately following the second and third chapters of Genesis, the study Bible provides an essay on “Gender in Genesis.” This essay highlights how both male and female are created in God’s image. It also addresses the term “helper” and how this word is not to be understood as a pejorative, for God is also called a helper in the Bible. It concludes by discussing how, even without institutional authority, the women in Genesis often prove powerful and influential in God’s unfolding story. Paul’s teaching in 1 Cor 14 is also accompanied by an article highlighting the historical setting and cultural context of the day. It points readers to 1 Cor 11:5 which speaks about women prophesying and praying in worship services. The CEB also corrects an editorial injustice often found in Eph 5. Some Bible translations have separated v. 21 from v. 22 by inserting a paragraph break or a new heading such as “Wives and Husbands.” When translators do this they encourage the use of proof texting and dissuade readers from viewing the entire context of Paul’s instructions. The main idea in v. 21 is a command for everyone to submit to each other; v. 22 gives a specific application within Christian households. The CEB has neither paragraph break nor subheading between v. 21 and v. 22: “21 and submit to each other out of respect for Christ. For example, wives should submit to their husbands as if to the Lord.” Another significant text to explore is 1 Tim 2. This section also has a corresponding essay which frames the passage within a domestic context rather than a church context. The CEB uses “wife” rather than “woman” in vv. 11, 12, 14, and 15 (with “woman” as a footnoted alternative). As a result, v. 12 reads, “I don’t allow a wife to teach or to control her husband.” In summary, the CEB translators and Study Bible contributors did an admirable job with some often misunderstood passages. Overall, the CEB translation offers a readable text. The contemporary language makes for a smooth cadence in corporate worship. Outdated and difficult to understand terms have been substituted with more modern everyday language. Rather than utilize a term such as “devoted things” from Josh 7, for example, the CEB simply refers to them as “items reserved for God.” Examples like this demonstrate how this translation can be faithful, accurate, and suited for contemporary readers. However, there are a few instances when the contemporary language may possibly skew understanding (e.g., “supervisor” instead of “overseer” or “bishop” in Phil 1:1). One sticking point for formal writers and some academics will be the CEB’s use of contractions within the text. In seeking to allow the Bible to speak in a modern language the translators have chosen to use contractions. Nevertheless, this element should not detract serious students of the Word from using the CEB. This translation is appropriate for personal devotion, group Bible studies, and corporate worship. The CEB Study Bible can help engage readers in the world of the biblical writers while remaining faithful to God’s intentions for God’s Word. Clergy and laity alike will benefit from the wide-ranging notes which can aid in developing sermons and lessons for small-group Bible studies. Among a crowded field of study Bibles, The CEB Study Bible readily distinguishes itself. I would highly recommend this Bible to Christians seeking to be molded by God into the people that God has called us to be.